Cheena Chhapra defined new trends and stole our hearts with women empowerment in the real sense of the word. I was nervous as I entered a room full of ladies, anticipating the scrutiny and the consequent remarks. The response confirmed my fears; right after greetings, I was bombarded with remarks about the weight gain and also the dreaded query about whether I was pregnant. Someone rightly said that don’t ask a woman if she is pregnant unless you see the baby’s head crowning. I guess the question is aimed more at making the person uneasy rather than the actual literal intention. The first thing that anyone notices about you these days, whether it’s in pictures or in person, is the weight. If it’s a compliment, it has to be about weight or it’s not worth it. Who cares about any other compliment, when you get to hear such comments? The weight of a person, it seems, has come to define them in this society. Being a plus-size woman is difficult. The salesgirls at the boutiques will look at you up and down and sympathetically let you know they do not have a bigger size in the dress you really liked. It is a headache to find something ready-made because for some reason, our designers are of the opinion that sizes stop at 14. Most plus size women then have to get their clothes stitched, and styling them is a whole other menace. First of all, plus-size women can look good if they are given the proper styling and clothes. Plus-size people have been reduced to a farcically small space, where they keep finding unrealistic angles to look thin or are forced into wearing blacks and vertical stripes. When it comes to pret wear, plus-size women have almost no options in Pakistan. 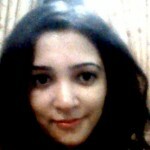 We don’t find their representation in ads or ramp walks. The lawn ads have skinny and petite models and the clothes are styled according to them. Most of the time, I come across plus-size women who have styled their clothes after the lawn models and end up looking not so good. The reason being that we have ghosted the plus-size women. Not everyone can style their clothes, and most of us rely on the picture that comes with the dress to style our dresses. Which, needless to say, is not the advisable course of action, unless you look like Deepika Padukone. You won’t find any plus-size models featured in mainstream high-street local brands like Sapphire or Nishat. When it comes to designing and representation for the plus-size, which makes a vast majority of the population, our major brands stay criminally clueless. Same is the case with high-end designers. 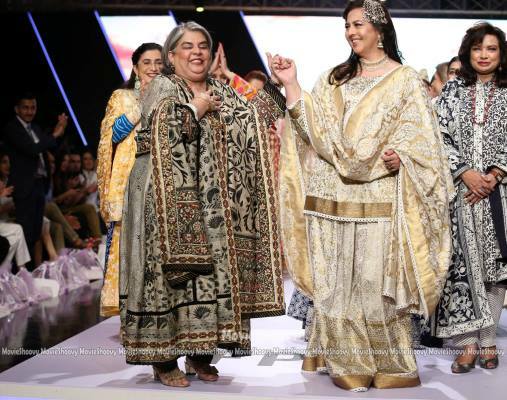 We don’t find the body size diversity in local designers and that’s why this week’s Fashion Pakistan Week (FPW) was really special. 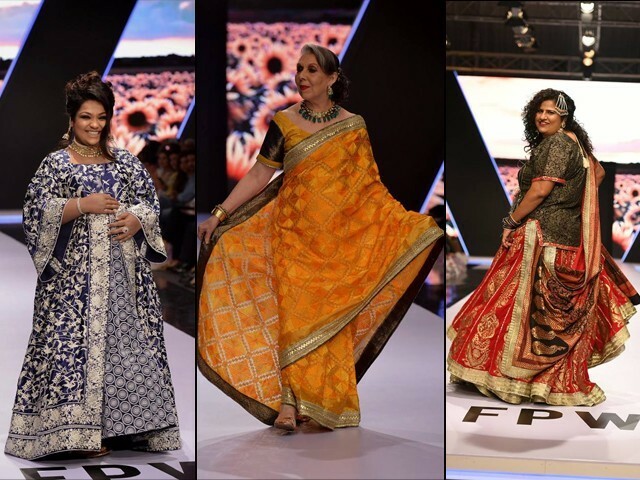 The new designer Cheena Chhapra stole the show with her plus-size line, which was inclusive not just of body types but also of age and beauty standards. When we say new designer, an image of a young graduate comes to our mind. But Chhapra has revamped that image for us. As she says in her beautiful Instagram post that it’s little late for her to enter the profession but she still has the enthusiasm of a 12-year-old. It is a really important message and a much-needed role model for the Pakistani women. We are so accustomed to the stereotypes of age that we don’t even imagine starting a new career or a career in the later bracket of age. Zubaida Tariq was one such example, and seeing women challenging the stereotypes paves the path for others to follow. In the routine mayhem of the FPW, Chhapra was a fresh breeze. Now coming to her collection; it was all about diversity and inclusion in full glory. It was a relief to see someone thinking about and designing clothes for plus-sized real people with real bodies. Professionally successful women from different walks of life walked the ramp for her and my personal favourite was the white number flaunted by Ayesha Tammy Haque. She was a vision in white, brightening the stage with her beautiful smile. It brings into visibility a new diverse standard of beauty and acceptance. Previously, some high-end brands such as Crimson have been endorsed by professionally successful women but they were as immaculate in body type as models. It seems as if our designers have whitewashed all other body types. Apart from body diversity, Chhapra’s collection included aging women who were comfortable in their skin. They didn’t need to dye their grey or white hair to fit into socially acceptable standards. There was a pregnant celebrity walking the ramp, emitting confidence and positivity. There was a middle-aged model covering her head and was elegantly dressed in red. We also saw many elderly women proudly walking the ramp for her. It again brings us to the fact that there are very limited options available for the elderly when it comes to dressing up. I don’t see any pret lines or formal lines for them. In a time when our local designers are being accused of racism and ignorant marketing strategies, Chhapra has emerged as a ray of hope. As a society, we need to encourage the importance of inclusivity because “real” women do not look like models, but if they keep seeing beauty as what is on the cover of magazines, they will come to look down upon themselves. Whether it be age, skin colour or body type, the important thing to remember is that beauty is non-binary and we as a people need to respect that. More power to you, Chhapra!